VidCon — the annual convention which draws the biggest digital celebrities and thousands of their fans — continued into its second day with several YouTubers announcing new shows and series that would depart the platform that launched their careers. Miranda Sings, whose channel has amassed over six million subscribers, shared with fans on Friday that her Netflix original series, “Haters Back Off,” will premiere on Oct. 14. The series was announced back in January and will follow the life of Colleen Ballinger-Evans, who created and portrays the egotistical wannabe singer. Grace Helbig, Hannah Hart and Mamrie Hart also announced at VidCon that their second film, Lionsgate’s “Dirty 30,” will be released digitally and air in select theaters on Sept. 23. The comedy follows the trio following a 30th birthday party that takes a wild turn. YouTube stars Tyler Oakley, Helbig, GloZell Green and Niomi Smart also took to the stage on Friday to discuss how writing their books felt like a more personal and reflective experience to them than the extent to which they share their lives online. Live streaming, while certainly not a new technology, was also discussed by YouTubers as an alternate way to share content. But in a Q&A session with Casey Neistat, the filmmaker and vlogger said he believed live streaming was only suitable for two instances: breaking news and sports. 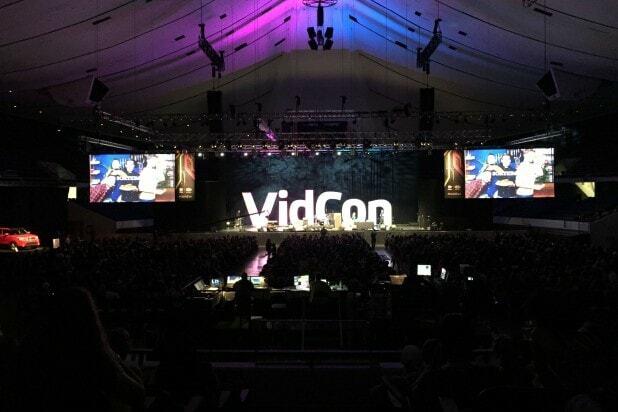 VidCon continues at the Anaheim Convention Center through Saturday evening. Watch the “Dirty 30” trailer below.